Agritourism and art in Città di Castello. Umbria is known as of the most hospitable agritourism places in Italy. 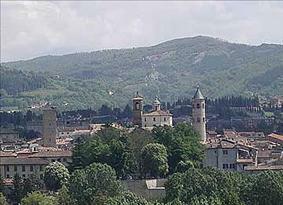 Umbria is known as of the most hospitable places in Italy. Not only for its many agritourism, farms holiday and holiday homes, which offer solutions from simple bed and breakfast to full board; not only for its restaurants offering tasty local dishes, and not only because of its relaxing green landscapes. It turns out that Umbria is also a region rich in art and history. Nestling in the upper Tiber Valley, in perfect harmony with nature, history, gastronomy and ancient and contemporary art, Città di Castello is a pearl in the wide green sea of the Umbrian hills, not far from the borders with Tuscany and Le Marche, offering visitors a delightful blend of history and nature, also thanks to the many agritourism farmhouses in the area. Like an ancient treasure chest, the city displays its riches in an historic context that takes visitors back to the charm of the past. A must for art lovers is the Palazzo Vitelli alla Cannoniera, home of the municipal art gallery. The first striking aspect is the setting. The paintings, in fact, find a natural home in its richly decorated rooms furnished in Renaissance style, where it almost seems as if time has stood still. The hall is exceptionally beautiful, richly frescoed with historic battle scenes from Hannibal to Charlemagne. The works on display range from the 14th to the 20th century, not only created by the skilful hands of unknown artists, but also by masters such as Raphael, Luca Signorelli, Carrà, De Chirico, De Pisis and Guttuso. Worth noting is the permanent exhibition of molluscs located on the lower floor, a beautiful and impressive collection of seashells from around the world. On display in the cathedral museum are fine examples of the goldsmith’s art, such as the Canoscio Treasure, a collection of 25 pieces, examples of early Christian art, and the silver altar of Celestino II from the 12th century. Modern art enthusiasts should not miss the Burri Foundation collection, located in two buildings, Palazzo Albizzini and the ex-tobacco drying building, where works by Alberto Burri are on show, a brilliant and innovative local artist. Burri's experiments raised to an art form the most common and unexpected materials, such as plastic, wood, metal and hessian sacks.